Are you on the Nice List? Watching the children with Santa is magical. Every kid that came in for the Santa Experience was a little bit nervous. I told every Mom and Dad, that I asked Santa to bring the Nice list. Every kid knew it would be here. Would their name be on it? Will they have to settle for a lump of coal? Jefferson was no different. Santa told him that him and the elves were kind of on the fence and didn't know if he made the list this year. Santa asked him what did he do this year that made him deserving of being on his most precious nice list. He said that he cleaned his room without being asked, and did his homework and said Yes Ma'am and Yes Sir. Santa seemed satisfied. But told him that he knew that he didn't always put his things where they go and sometimes he had to be asked more than once to do things. He said everything counts. He checked his list twice and Jefferson found his name. What do you do when you make the nice list? You shoot a couple of thumbs to Dad. This kid is pretty darn fantastic. So what is the Santa Experience? This holiday season Ellenburg Photography is offering you and your family a one of a kind Magical Christmas Experience. Private un-interrupted time for you and your family with Santa in a warm, inviting setting with all the personal touches of the North Pole . How much time? YOU DECIDE. See your child's name on the Nice List. Read your Christmas wish list to Santa. Learn about how Santa travels all over the world in one night. Hang a special ornament on the tree with Santa. Enjoy cookies & milk with Santa. All of these magical Christmas moments will be created into the beautiful portraits you've always dreamed of for now and years to come. 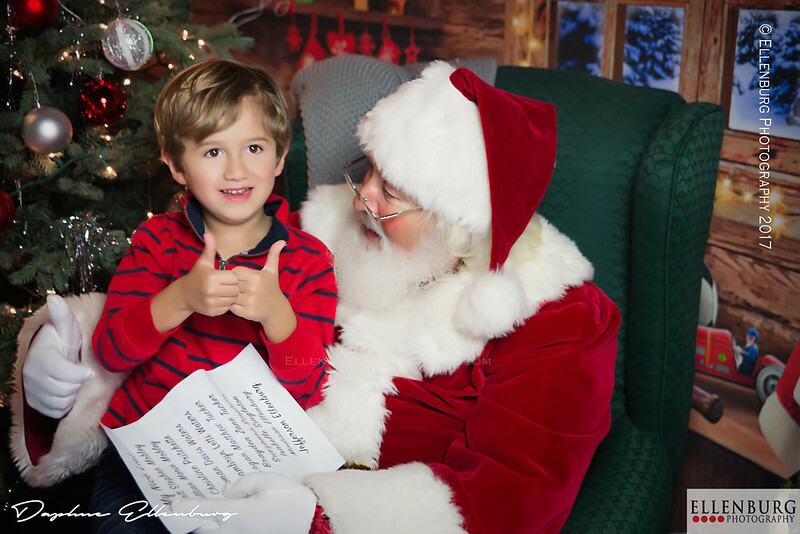 LAST year's Santa experience sold out and it was completely amazing. This great event will be happening Saturday and Sunday, November 17th and 18th. We only have a few spots still open. If you want one, get it now or tell someone who LOVES Christmas as much as you do! Daphne Ellenburg is the owner of a bustling Portrait photography business called Ellenburg Photography located in Southern Alabama. Daphne has a supportive family and a fancy-pants NEW 2000 sq ft studio. She loves college football, big handbags, lip gloss and all things Apple. She also enjoys writing about her Photo-Adventures and her entertaining family. Daphne is a proud member of PPA, WPPI, and the local chamber. Catch up with her at EllenburgPhotography.com or email her at daphne@ellenburgphotography.com.